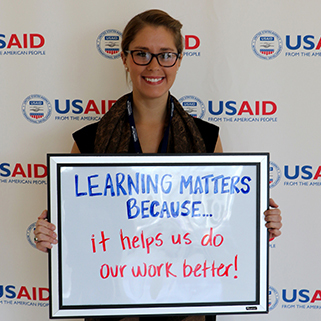 LEARN is a contract funded by the Bureau for Policy, Planning and Learning (PPL) that supports strategic learning and knowledge management at USAID to improve the effectiveness of programs in achieving sustainable development outcomes. It provides USAID bilateral and regional missions and Washington operating units access to expertise through buy-in to the contract for technical support and services. Since Washington bureaus play a critical role in guiding missions’ implementation of the Program Cycle, LEARN can work with Washington-based operating units to support the Agency’s efforts to operationalize collaborating, learning, and adapting (CLA). Please contact Monica Matts, COR for LEARN, at mmatts@usaid.gov for more information about buying into the LEARN mechanism. LEARN supports PPL’s efforts to facilitate missions’ deeper understanding of CLA in practice—identifying their current practices and approaches and what they can do to improve results by operationalizing CLA. Through self-assessment, missions identify and prioritize work processes for more intentional, systematic, and properly resourced collaborating, learning, and adapting. LEARN helps missions to then formalize CLA Plans and builds capacity through tailored technical assistance. CLA PLAN DEVELOPMENT: facilitating the development of a CLA Plan as part of the Performance Management Plan, detailing how the mission will address and resource CLA. PROVISION OF CLA ADVISORS: advisors hired and trained to work intensively with the mission to institutionalize learning—their assignments may range from several months to two years. CLA CAPACITY BUILDING CLINICS, WORKSHOPS, OR COACHING: in-person or virtual training and mentorship offered to targeted mission staff, the mission as a whole, or for regional CLA events. SUPPORT FOR LEARNING AGENDA DEVELOPMENT: guidance in developing learning agendas for projects or activities. CDCS MID-TERM STOCKTAKING SUPPORT: overall planning, agenda development, and facilitation expertise provided for CDCS mid-term reviews.